This is another one from my old blog. It's taking me a while to get all the crochet and knit patterns transferred. Mostly because I'm kind of forgetful. Please excuse the quality of the photos. They are from a few years ago. (2007 to be exact) These potholders are the kind that are in daily use in my home. They are completely functional and work even with things like TG's new cast iron waffle iron that gets very, very hot handles. This is a great scrappy project. When I'm giving them as gifts, I plan them out by the recipients favorite colors and work with striped patterns that are interesting. But when I make them for my own home? It's bits and scraps from other projects. Although I haven't made any for myself in a long time (since about 2007!) because we have several and they last really well. Cotton worsted weight yarn- the cheap stuff is fine as long as it's all cotton and worsted weight. Pattern is in American terminology. But really, you don't need a pattern. Just crochet a big square. Magic ring start, 8 sc in ring, pull ring closed, sl st to join. Ch 1, sc in same st, 3 sc in next st, sc in next st, 3 sc in next st, sc in next st, 3 sc in next st, sc in next st, 3 sc in next st, sl st to join. Keep working in rounds, working plain until you hit the center of the 3 sc corners in the previous rounds, and do 3 sc in that st. Yep. Like I said, it's just a square. At the end of mine, I had 37 sc on a side plus the 3 sc corners. Fold the corners into the center on the lines marked in black, and pin them, then join the edges in the middle with single crochet, add a loop at one corner if you want one. You'll have to do it in 2 passes, one corner to the other, break off, weave in ends, then the other set of corners. Thread a yarn needle with whichever color you want, and stitch down on both sides of the sc row through both layers. I used a running stitch, then went back down the stitch to fill it in a make it a solid line of stitching. See? Easy peasy, and functional. Michael has big hands, and most potholders are too small for him, plus you know how sometimes if your hands are even the tiniest bit moist, you'll burn yourself through regular potholders? Doesn't happen with these. You can figure the diagonal of a square by multiplying the sides by the square root of 2. 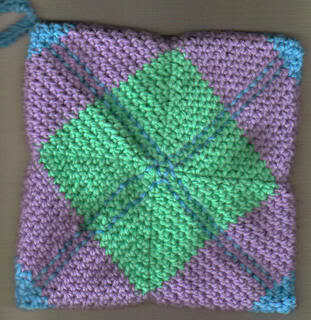 Because crochet is inexact, it's okay to round the number to 1.4 - but how do you figure the size of the base square for one of these kinds of potholders? 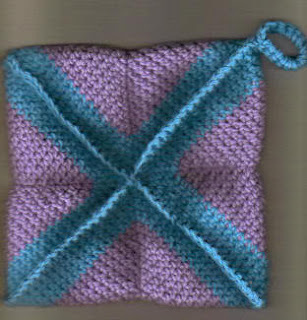 Figure out how big you finished potholder to be- that will be A, then divide that by the square root of 2, or by our rounded number, 1.4, then multiply that number by 2. So if you want a finished 8x8 inch potholder it would be 8/1.4= 5.7 (still rounding) x 2= 11.4, so anything just about 11.5 inches on one side will give you a potholder that's approximately 8 inches. You can check out the project gallery for this on Ravelry here.